Mississauga, ON – The Canadian Hockey League today announced the ten national award winners for the 2010-11 season including Ryan Ellis of the Windsor Spitfires who earned both the CGC Defenceman of the Year and CCM Player of the Year Awards. Ellis becomes the first player to win both awards since Bryan Fogarty of the Niagara Falls Thunder in 1988-89. Winners were presented with their awards at Hammerson Hall in the Living Arts Centre in Mississauga as part of the 2011 MasterCard Memorial Cup festivities. An 18-year-old from Burnaby, BC, Nugent-Hopkins is the number one ranked North American skater on NHL Central Scouting’s Final Rankings for the 2011 NHL Entry Draft. He led the Rebels and finished tied for third in the WHL scoring race with 106 points in 69 games during the 2010-11 regular season while his 75 assists led all WHL players in that category. He was also named Player of the Game for Team Orr at the 2011 Home Hardware CHL/NHL Top Prospects Game. Also considered for the award was Gabriel Landeskog of the Kitchener Rangers, and Sean Couturier of the Drummondville Voltigeurs. The 21-year-old from Sorel-Tracy, Quebec, dominated the scoring race in the Quebec Major Junior Hockey League with 47 goals and 114 points, while recording only 31 penalty minutes. His work ethic, classy demeanour and sportsmanship also helped him capture the Frank.-J.-Selke trophy as the QMJHL’s top gentleman. Also considered for the award was Jason Akeson of the Kitchener Rangers, and Tyler Johnson of the Spokane Chiefs. A 19-year-old from Wakaw, SK, Vey finished the 2010-11 regular season with 46 goals and 70 assists for 116 points along with a +37 rating in 69 games to lead the CHL in scoring. Vey scored 13 power play goals, five shorthanded markers and seven game-winning goals. The recently signed Los Angeles Kings prospect recorded at least a point in 54 of the 69 games he played this season. 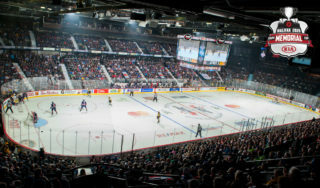 Jason Akeson of the Kitchener Rangers and Tyler Toffoli of the Ottawa 67’s led the OHL in scoring, while Philip-Michaël Devos of the Gatineau Olympiques led the QMJHL. A 20-year-old from Coquitlam, BC, Edwards was involved in many community programs throughout the year, including a “Captain’s Care” program which he created himself. The program saw the Warriors captain make regular visits to the Moose Jaw Union Hospital to spend time with sick children. He also played a large role in the Warriors “Get Gutsy” campaign, which saw the team raise thousands of dollars for Crohn’s and Colitis. Also considered for the award was Jack Walchessen of the Peterborough Petes, and Gabriel Lemieux of the Shawinigan Cataractes. A 17-year-old from Toronto, ON, Hamilton attends Governor Simcoe Secondary School in St. Catharines where he maintains an overall academic average of 94% in six Grade 12 level courses. On the ice, Hamilton is the top ranked defenceman for the 2011 NHL Entry Draft rated fourth overall among North American Skaters by NHL Central Scouting. He finished fourth in scoring among OHL defencemen with 58 points in 67 games scoring 12 goals and 46 assists and a team-high plus-minus rating of plus-35. 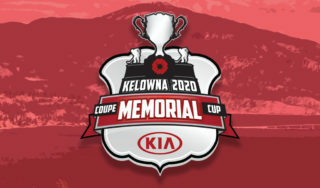 Also considered for the award was Nicolas Therrien of the Chicoutimi Sagueneens, and Colin Smith of the Kamloops Blazers. 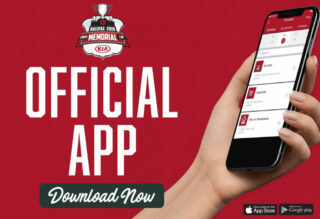 A native of Summerside, PEI, Gallant wins this award for the second straight season after leading the Sea Dogs to a first overall finish in the QMJHL standings with 58 wins and 119 points while maintaining top spot in the BMO CHL MasterCard Top-10 rankings for the final 15 weeks of the season. Gallant becomes just the second coach to win this award in back-to-back seasons following Bob Boughner who won the award in 2008 and 2009 with the Windsor Spitfires. Also considered for the award was Mark Reeds of the Owen Sound Attack, and Don Nachbaur of the Spokane Chiefs. A 17-year-old from Nizhnekamsk, Russia, Yakupov led all rookies and finished tied for fourth overall in OHL scoring with 101 points in 65 games scoring 49 goals and 52 assists. Eligible for the 2012 NHL Entry Draft, he became just the fifth OHL rookie to reach 100 points in a season in the last 15 years. Yakupov also established new Sting record for goals and points by a rookie surpassing the marks set by Steven Stamkos in the 2006-07 season. 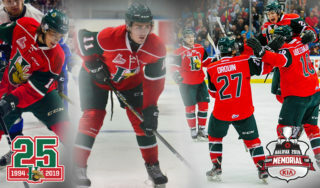 Also considered for the award was Charles Hudon of the Chicoutimi Sagueneens, and Matt Dumba of the Red Deer Rebels. A 21-year-old from Saskatoon, SK, Kuemper backstopped the Rebels to a Central Division crown for the first time since the 2002-03 season. The recently signed Minnesota Wild prospect appeared in 62 games this season, and led all WHL goaltenders in every major statistical category including wins (45), goals-against average (1.86), save percentage (.933) and shutouts (13). Kuemper’s 13 shutouts also tied a WHL single season record. Also considered for the award was Mark Visentin of the Niagara IceDogs, and Jacob DeSerres of the Saint John Sea Dogs. A 20-year-old from Freelton, ON, Ellis led all defencemen in scoring and finished tied for fourth overall in the OHL with 101 points in 58 games scoring 24 goals and 77 assists. He became the first OHL defenceman to score 100 points in a season since Jamie Rivers of the Sudbury Wolves recorded 121 points in 1993-94. The Nashville Predators prospect was a nominee for this award in 2008-09 and became just the third defenceman in OHL history to record 300 career points. Also considered for the award was Simon Després of the Saint John Sea Dogs, and Stefan Elliott of the Saskatoon Blades. Ellis, who scored 101 points in 58 games with 24 goals and 77 assists, becomes the first defenceman to win this award since Brian Campbell of the Ottawa 67’s in the 1998-99 season. 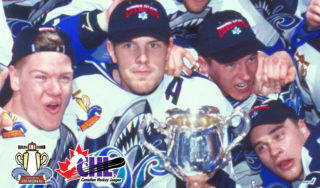 A winner throughout his four-year junior career with the Spitfires, the 2009 first round pick of the Nashville Predators captured two OHL and Memorial Cup titles and was named to the MasterCard Memorial Cup All-Star Team in 2009. Internationally, Ellis is the only player in the history of Hockey Canada’s Program of Excellence to win Gold at each of the World Under-17 Hockey Challenge (2008), IIHF World Under-18 Championship (2008), Memorial of Ivan Hlinka (2008), and the IIHF World Junior Championship (2009). 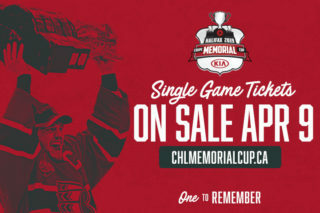 He also earned silver medals with Canada at the 2010 World Junior Championship and again in 2011 in Buffalo, NY, when he served as Team Captain and was named Best Defenceman of the tournament setting a new IIHF and Team Canada record for most career-points by a defenceman with 25 in 20 games. Also considered for the award was Sean Couturier of the Drummondville Voltigeurs, and Darcy Kuemper of the Red Deer Rebels.